Were her black waistband and clutch a subtle reference to the Time's Up movement? 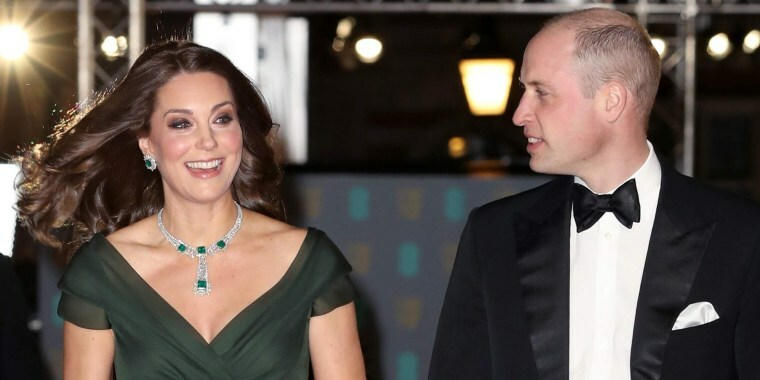 The Duchess of Cambridge looked gorgeous in green at the BAFTAs! She and Prince William on Sunday attended the British Academy of Film and Television Arts awards, which are essentially the British equivalent of the Oscars. The pregnant duchess wore an elegant forest green Jenny Packham dress, paired with a dazzling diamond and emerald necklace, bracelet and earring set. Her public fashion choices almost always make headlines, but her outfit at the BAFTAs was under particular scrutiny. Most of the female guests opted for black dresses in support of the Time’s Up movement, which aims to end sexual assault and achieve gender equality in Hollywood and beyond. The night’s unofficial black dress code put the duchess in a tricky position because royals traditionally are not supposed to take overt political stands. Wearing black would be too openly symbolic, but wearing any other color would also make a statement. In the end, the duchess seemed to go for the middle ground. Though her dress wasn’t black, she stuck to a subdued shade of green. Also, the gown’s black waistband, along with her black clutch and shoes, could have been a subtle nod to the Time’s Up cause. While most of the women on the red carpet did wear black, many added accents of color or metallic detailing. Nominee Allison Janney went for a simple black gown with a daring gold neckline. Margot Robbie’s gown was overlaid with silver swirls that added a little shine and texture to her all-black ensemble. Actress and singer Haley Bennett went for a half-black, half-metallic gown and a beaded clutch. There must have been a memo going around about metallic detailing, because “House of Cards” actress Kate Mara also opted for a black gown with embellished art deco-inspired gold tiers. Meanwhile, other stars stuck to true black. Angelina Jolie exuded old Hollywood glam with this off-the-shoulder gown. Jennifer Lawrence went for solid black, too, though with a touch of tulle at the shoulders. Lupita Nyong'o accessorized her Elie Saab gown with a Time's Up pin. And nominee Annette Bening looked gorgeous in a simple black gown with sheer shoulders and a black shawl. The Duchess of Cambridge hasn’t opened up about the possible symbolism of her black sash and clutch — but as these outfits remind us, there are many different ways to make a statement.